How important is using Twitter to grow? Social networking is important for any streamer, but especially important for streamers with new and/or small channels. Without networking, you rely on people find you at the bottom of the list, or the only one playing an obscure/niche game. You should expand your efforts to multiple social networks, including Twitter and YouTube. Spread a wide net. The more places you can be found, the more avenues you have to bring in new people. If you’re new to Twitter, get rid of your “egg” as soon as possible. Then get a banner to replace the default blue header. People are much more hesitant to follow/care about accounts that look generic. Would you follow this account? When replacing the default egg and blue header, it is not important that you immediately have your own custom graphics. If you do not have your own art, add art that is related to your stream in some way. For instance, the games you play or something that represents your favorite genre. You can add your own art later when you think you need it. Ok, so you have an icon and a banner for your profile. What’s next? Let’s look at a couple examples. 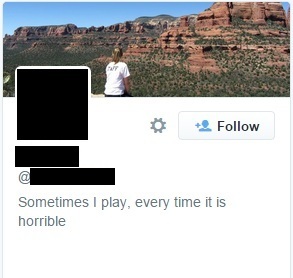 The following is from a real streamer’s FULL Twitter profile page. What’s wrong with this profile? First, one good thing: there’s a link to their channel below the description. Great! Now the bad: There’s no mention of them being a streamer. There’s also no link to their channel IN the description. Why is it important to have the link in the description? Let’s look at how the description appears when not viewing the FULL profile page. Nothing indicates that this person is a streamer. Also note that you cannot see the link to Twitch in this view. This is the view that MOST people will see. Most people will never look at your full profile. Therefore, do not rely on links below your description. From this simple description, you know he’s a streamer, what he streams, and where his channel is located. No egg, no blue header, and he even includes a photo! Is it his photo? Who cares? 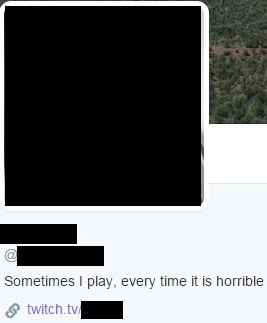 Follow his example for a great profile description! Ok, so you have set up your profile and description. What about your content? When you are about to go Live on your channel, and every few hours while you’re Live (during break time), or when you change games. When you make a new highlight / clip / video. When you conclude your stream. Thank people for coming. When you’re raided, to thank the person whom the raid came from. Post about upcoming events on your channel, and other related news. But remember, it’s not just about you. Everyone at GSC believes that growing as a streamer involves growing your favorite streamers with you. Help your fellow streamers out by following them, interacting with them, and helping hype their stream when they’re live. Retweet their tweets about their stream. People love being retweeted, and they will return the favor when it’s your turn to stream! 1) The game or games you’re going to play + a very brief description. 2) The link to your channel. Believe it or not, many people forget these two essential things! If you don’t state the game you’re playing, new people are not going to drop in just to find out. If you prefer, you can use a hashtag to indicate the game you’re playing, for example #CSGO. This attracts the attention of that player base and stream retweeters for that game (discussed shortly). Beyond those two basic items, it is highly recommended you include a picture. Make sure it is somehow related to your stream or what you’re playing. It can be as easy as taking a screenshot of what’s happening on your stream and using that as your picture. If you have your own custom artwork, you can attach it to a tweet when you’re about to go Live! Mike’s tweets stand out tremendously because he includes his custom-designed artwork. 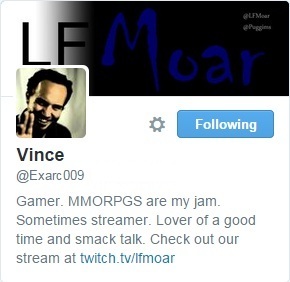 You can follow Mike’s example by mentioning stream retweeters in your tweet. 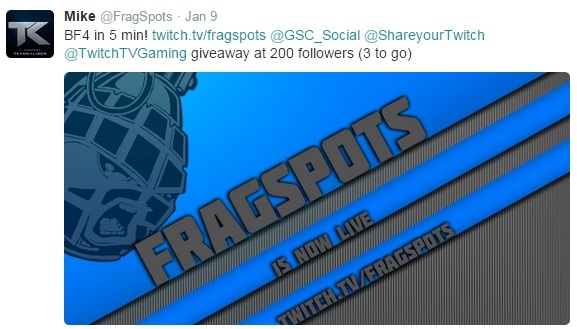 Stream retweeters are Twitter accounts that exist solely to retweet channel links. Simply mentioning them is usually sufficient to get your tweet shared with people. Which ones should you use? You need to experiment with them all and see which ones retweet you the most often. Our list has stream retweeters that retweet all streams, regardless of the game. 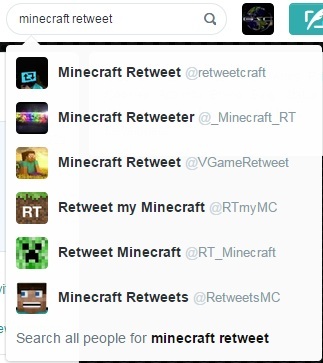 However, if you play very popular games, you can use stream retweeters that only retweet for those games. Search for stream retweeters for your games of choice. Be aware that even if you are retweeted to many thousands, maybe only 1 or 2 will drop by. It’s just another tool to try out for yourself. That being said, avoid the temptation to bulk up on the stream retweeters. Don’t do this. 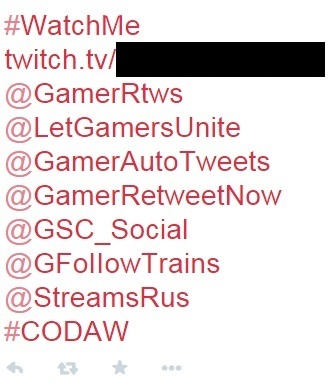 Many stream retweeters do not share tweets that look like this. Fitting all these items on every “Going Live!” or “I’m Live!” Tweet can be difficult, but remember that #3 and #4 are optional. Should you use JustUnfollow (Et al.) on your Twitter account? JustUnfollow and other similar apps help automate some of your Twitter activity. JustUnfollow in particular is well-known for allowing you to send automatic direct messages to anyone that follows you on Twitter. You can customize these messages to thank new followers and encourage them to visit your channel. Should you use this kind of app? It is a matter of personal choice. Some people view the messages as spammy, but others swear by their effectiveness in gaining new followers. You have to try it to see if it’s for you. Should you connect your Twitch to Twitter? In your settings on Twitch, you have the option to connect your Twitch channel to your Twitter account. Then, whenever you go Live, Twitter will take the current title of your stream and tweet it out automatically. There are a few things to be aware of if you choose to connect. The tweet is automatic, so you cannot fully customize it. For instance, there’s no way to add a picture to the tweet. If you forget to change your title before you go Live, it will tweet the wrong title. If you have technical difficulties and have to restart the stream several times, it will tweet each time you restart. Many people choose to connect since it is simple and automatic. You may choose to use it or not, but it is good to know that it is available to you.